In 1981, I started traveling with my family. Little did I know what plans God had in store for me. I’m NEVER surprised, but ALWAYS amazed at how God works. All of my life I had people tell me that they thought I would preach someday. I never believed them. I thought I was already doing what God wanted me to do by playing and singing. Boy, did I have myself fooled. God started making opportunities for me to preach. So in 1996, I was licensed into the preaching ministry. In February of 2000, I met my wife, Tabatha. We were booked in her home church in Crowley, Louisiana. By August 25, 2000 we were married. Tabatha joined me on the road traveling on most of the dates. I knew she had a desire to minister. In fact, she told me after we married that she had prayed for God to send her a preacher. Well, she got one. In November of 2002, we completed our first album together entitled “Family Tradition.” The title is significant because I wanted to carry on with my new family what I had been taught all of my life. First, living a Christian life and truly knowing Jesus Christ as savior and Lord. Second, using the gifts he gave us to take it to a world that needs to hear that Jesus loves them. October 17, 2002 our son, Tanner, was born. What a blessing he is. We kept telling each other that God was about to do something different with us, but we didn’t know what. Well, in August of 2003, God saw fit to move Tabatha and I into our own ministry. We took that step of faith, and God has abundantly blessed our faithfulness to obey him. Over the last several years we have seen countless decisions in the altar services. Someone coming to the saving knowledge of Jesus is what we strive to see, however God moved in MANY more ways. I don’t like to use the phrase re-dedicate. I like to say 100% completely being “SOULED-OUT”. A lot of people have their fire insurance policy and have let God be savior but not Lord of their lives and we have seen people do just that. To list every last decision would take up so much space that there isn’t time and space to list every one of them. 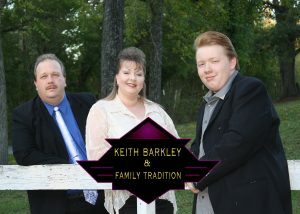 Whatever kind of service you’re looking for, whether it be a concert, campmeeting, or Bible conference, rest assured that “Keith Barkley & Family Tradition” will be a blessing to you. One thing is very important to know. We always come to be a help and not a hindrance to your church. If you would like more information on how to have “Keith Barkley & Family Tradition” minister in your church, please fill out our booking request form or feel free to call our office. We would love an opportunity to minister and worship with you.